Over thirty internationally recognized scholars have contributed these studies in honor of noted Anatolianist and Indo-Europeanist Norbert Oettinger, including Bernhard Forssman, Heinrich Hettrich, Michael Janda, Jean Kellens, Hartmut Matthäus, Stefan Zimmer, and the late Jens Elmegård Rasmussen and Calvert Watkins. 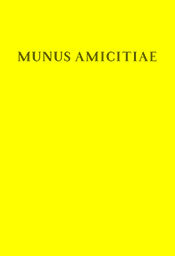 As befits its honorand, Munus Amicitiae ranges widely, with essays treating diverse topics not just in Anatolian linguistics, but also general Indo-European, Germanic, Indic, Celtic, and even Aegean archaeology. A complete bibliography of Prof. Oettinger's works to date, plus a word index, round out the volume. Click here to see a full list of the contributions.